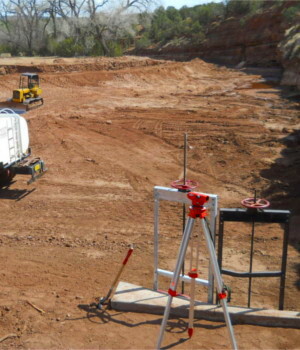 The rehabilitation consisted of the demolition of a failed concrete diversion dam, the placement of compacted earthfill embankment, the construction of a rock filled gabion wall, furnishing and installing miscellaneous reinforced concrete structures and metal works including the CMP and slide gates. The rehabilitation consisted of the excavation of vegetation, soil and rock rip rap along the reservoir embankment. 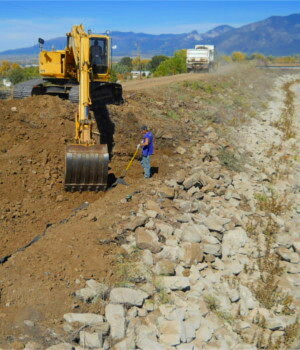 The restoration of the embankment included the installation of the HDPE liner, geogrid cells, and coarse backfill as well as the replacement of rock rip rap. The backfill reshsaped the crest of the reservoir dam to be ten feet wide with and 2.5:1 side slopes.